Dining Area, table seats 6. Outdoor table seats 4. Ground Floor Convenience. Waterscape's Most Private Ground Level Unit. Waterscape B112, Ground level condo, steps from the sand! Waterscape B112 is located on the Florida Panhandle in the Destin/Ft. Walton Beach area and is one of the most popular resorts on the Gulf Coast. We are a 2 bedroom, 2.5 bath condo with all the perks you'd expect from a 5-star resort, plus many that you haven't yet considered. Waterscape B112 is on the ground level in the B building and is located in the desireable "inside" of the U, only 6 units back from the beach. We are the first unit to the largest waterfall and largest pool. Our centralized yet private ground floor location is highly desirable and considered a "prime" location within the resort. This unit contains two master suites, which is perfect for traveling with extended family or another small family. 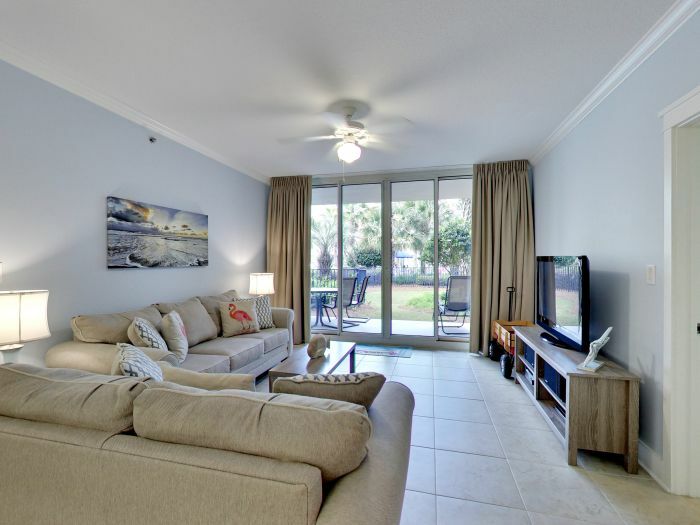 The living room and both bedrooms open to the spacious, sun-kissed patio which includes seating for 4, two lounge chairs, and a deck box filled to the rim with beach toys and floats. B112 boasts a fully-stocked kitchen making cooking-in a breeze (but of couse, cooking is optional!). The living room has a full-size sofa that converts to a Queen size tempurpedic-topped sofa bed, a love seat, and an HDTV in case you need to spend some down time indoors. B112 is colorful and classy, offers a beachy charm, and has been carefully designed to feel like home. We have selectively stocked the condo with things you need, but nothing you don't. We offer 4 beach chairs, a large 8' umbrella, and a beach cart to provide front-row beach seating at your leisure. This equipment is also handy at the pools, as sometimes vacant chairs can be difficult to come by. We furnish an all-terrain wagon for your little ones, a pack-n-play, high chair, and a variety of other items to make your visit easy. These are a few of the details, but I don't want to spoil all the fun! Waterscape B112 contains the resort's only rope-lighted bunk room. Additionally, there is a cable-connected HDTV on both the top and bottom bunks. This puts children in the right mood and makes them happy to climb into their sleeping quarters. Our bunk room features a light blocking and sound insulating curtain, making sleeping in a breeze. This unit sleeps 8 people comfortably. 2 bedrooms, 2.5 bathrooms, plus a bunkroom. Maximum occupancy is 8 people (infants included). Master Suite has a king size Sleep Number bed. Master bedroom has a king size Tempurpedic bed. 2nd master bath has a single vanity, a walk in shower, and a large bathtub. Bunk Room has bunk beds and a light-blocking, sound insulating privacy curtain to keep your kids soundly sleeping. B112 has a keypad lock. No dealing with the front desk. Convenience is key (pun intended). Comes with 4 chairs, umbrella, anchor, and an AWESOME beach cart for your use. This is our third stay with Danica and our first in B112. This is by far our favorite condo. The location cannot be beaten. From unloading your car to getting around during the day, it's perfect! We are a family of 5 with a 7yr old, 5yr old, 2 yr old, and one on the way. She stocks these condos to the brim for families and it really makes the stay. My kids had plenty of beach toys and balls to play with and keep them entertained while we were making food or taking a break from the sand or water. April is also a great month for the beach! It was not crowded at all. The pool water was chilly but that didn't stop my kiddos. Also, you cannot find this level of service anywhere. She kept in constant contact with us and she had issues covered before they even arose! We will definitely be back for a 4th trip and will always choose B112! We spent a full week in B112 for our spring break and it was wonderful! As promised, it is fully furnished, including the kitchen. We have a big family, so I cooked all but one day and had everything I needed for breakfast, lunch, and dinner. Because of it's space, this was one of our better stays. Our kids are teenagers and had plenty of room to spread out and not get on each other's nerves. ;) Bathrooms were huge, which was very helpful (having four teenage girls.) Danica was quick to respond when we had questions. The beach and resort were beautiful. It was just a quick walk down the beach to the boardwalk, such convenient placement! Another perfect stay at our home away from home! It was our first stay in B112 and we loved how close it was to the beach. Just like C203, the condo was fully stocked with everything we needed. It was clean, bright, comfortable, and beautifully decorated. I even found my favorite pampered chef cooking utensil in the kitchen. The kids loved the TVs in the bunk room and the toddlers loved riding in the wagon. As always, we can't wait to come back and stay at our favorite place with our favorite condo owner again! Awesome place for a young family to vacation! The condo is nestled on the ground level in the most convenient location. The condo was gorgeous and comfortable, felt like home for 6 days! Beautifuly decorated, Danica thinks of the smallest of touches. I would recommend this rental over and over! We stayed at Waterscape Condominium in condo B112 for 9 weeks as our 1st experience as “snowbirds”. We were lucky enough to find this condo at ‘Waterscape Rental by Owner’. 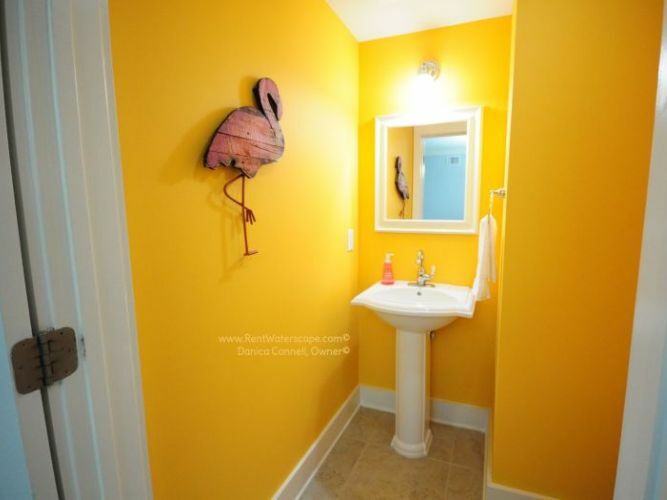 The condo is very clean and has everything you would need; it is decorated very nicely with a seaside décor. 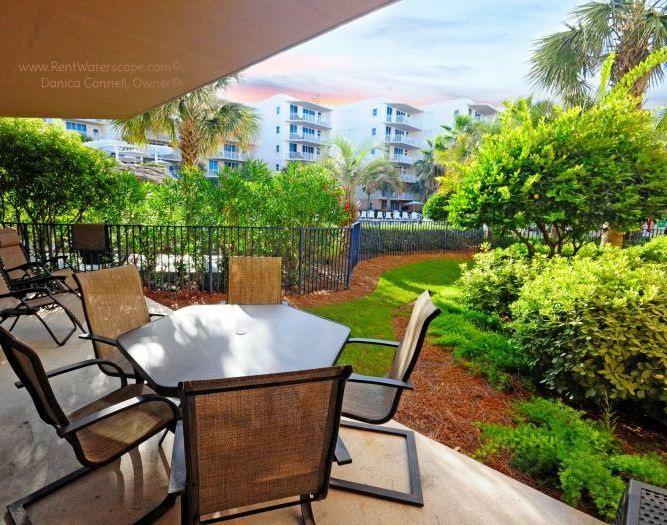 The condo is convenient to everything, restaurants within walking distant, Destin 6 miles away. Danica is a pleasure to work with and very responsive to any need you might have. Danica went over and beyond to accommodate our group. Even with last minute changes and a hurricane looming she went out of her way to make sure we were happy. The place was amazing! The pools, beach and amenities were top notch. We had an amazing time and can't wait to go back! We just had our second stay in one of Danica's condos!! Our stay both time was excellent!! We stayed in C203 when our kiddos were small. It was perfect having the large grassy area in front of the condo and being close to the toddler area. This time we stayed in B112. It was nice having the 2 super comfy king rooms, and the kids loved the bunk room, each having a tv!! Was nice being a quick stroll to the beach in B112 too! She thinks of every detail and goes above and beyond to make your stay perfect!! With hurricane Michael coming she offered that we could leave a day early and be refunded which was super nice--most places don't have that level of service!! We will be back again!!! This was our 3rd year staying in B112. As always it was a wonderful stay. It is the perfect condo for families with children. There are so many extras provided (beach chairs, beach cart, sand toys, floats, etc). This allow us to pack a lot lighter. I cooked a few meals and the kitchen always has everything I need and more. We have already booked our 4th stay in 2019. Vacation in one of Danica's condos has become something we look forward to all year! She is SO nice and takes great care of every little detail and then some! Her condos are so well decorated and stocked with everything you could ever need! The personal touches she adds make you feel like an honored guest and right at home. The amenities at Waterscape cannot be beat when vacationing with kids. You never have to leave the grounds! Vacationing with the 1 year old and 3 year old grandkids is still relaxing at this resort. Very few times in life is something better in real life than the pictures and the reviews. Danica was amazing to work with and accommodated every request exceeding or expectations. We stayed in C203 with two couples and two 2 year old girls. We were steps away from the toddler area and a less than 2 minute walk to the beach. The location was perfect for us and the condo had EVERYTHING you could need. The pools and lazy river were amazing and super well kept. We wanted for nothing other than the cooking spray we wished we had added to our SHIPT grocery delivery. The kitchen table was also a little too tall to accommodate high chairs but we ate outside most of the time, so that wasnâ€™t a big issue for us. We didn't didnâ€™t rent a car and were dropped off from the airport via Destin Airport Shuttle and Taxi (who I would also highly recommend! Very prompt and professional). We had no shortage of things to do within walking distance (putt putt golf, gulfarium, great restaurants, liquor store across the street). I think this would be the perfect place to stay for any family with kids under 12/13. But honestly, I could have enjoyed it as a couples trips or girls getaway too.... love Waterscape! Thanks again Danica! Our group of 8 absolutely loved staying at Waterscape C505. The condo and views are stunning and we hated to leave. The owner was absolutely awesome to work with she made our stay perfect. The personal touches made my day. From texting us congrats on our wedding day to the personalized gift for the kids. Do not hesitate to book through her. This was the best decision we could have made. We can't say enough about our vacation. B112 was beautifully decorated, clean, and stocked with all that we needed to enjoy our time. When we walked into B112, our children, ages 3 and 7, kept saying, "We love this home." We especially appreciated the extras that Danica provided: 4 very comfortable beach chairs, a humongous umbrella, and a life-saving beach cart! Without hesitation, we whole-heartedly recommend planning your next vacation with Danica. We know we will. We had an amazing vacation at Waterscape. The unit we stayed in had everything we needed plus some! It was beautifully decorated and we loved all the small touches that made it feel like home... TVs in the bunk room, the pack n play and high chair, all the kitchen utensils we needed to grill poolside or cook in the kitchen! The beach cart and chairs were perfect to get right next to the water and watch the kids play. Thankful for a wonderful vacation and definitely plan on coming back! We stayed in unit B112 and loved it! The unit was furnished with everything you would need including beach gear and toys. It was clean and spacious enough for our group. The younger kids loves the bunk bed area. Danica provides top service and keeps in touch with you to answer any questions or help with any issues. We would definitely recommend her rentals. Family Friendly and Excellent Location! Everything was perfect!!! The unit was clean, decorated so nice and well stocked. It has so many nice touches like a beach cart, chairs, and games. The kiddos loved the area with the bunk beds. It was super close to the beach and the pool. We all had a great time and can't wait to go back! The B112 condo was amazing! I can be incredibly picky about the cleanliness of places and this condo was so clean, it felt like home! The beds were so comfortable. The location of it is perfect, especially with kids. Danica was amazing to work with and her recommendations for everything, including where to eat were spot on! We will definitely be back! Thanks for a great vacation! I searched and searched for a long time for the perfect vacation. This was a Christmas gift for my two daughters ages 10 & 12. We have a new baby as well so finding a place where my older kids would enjoy and where we could comfortably take a new baby was most important to me. I came across Danica’s rentals and I was drawn to her rave reviews. I wanted a home away from home with easy access to the beach and things for my older children to enjoy. This place has it all! Danica’s rental was immaculate and had everything we needed. The older kids were able to go off and play in all the pools while one of us parents stayed inside with the baby when needed. It was perfect! The easy access to the beach is ideal! I cannot say enough good things about Danica. Talking to her is like speaking with a friend you have known forever. She goes above and beyond to make sure your vacation is a breeze. If you are looking for a beautiful beach resort where your kids will have memories to last a lifetime, and mom and dad can relax because Danica takes care of everything, look no further. We absolutely had the best vacation. This is our second year staying at Waterscape but this time we rented from Mrs. Danica and it was such a great and easy process. She went above and beyond to make sure we had everything we needed and even left our daughter the cutest outfit with her initials on it. We will definitely be renting from her again next year and the years to come. My husband and I were staying at the Hilton next door last fall and we happen to see B112 chairs on the beach and checked out Danica’s website. We wanted a 1st floor unit on the inner area and reached out to her to see if we could see one of her units while we were there. Our experience was top notch from the day we saw the condo to the day we put our deposit down to arriving and leaving. It’s equipped with many amenities and was so clean when we arrived. It was our family Christmas present and our 1 yr. old grandsons first beach vacation. Thanks again Danica, we’ll be back! We had a great stay at Waterscape in unit B112. Danica provides you with so many extras. We loved having all the beach gear. It made it super simple to get to the beach with all our stuff and we didn't have to rent anything. We flew so were limited on what we could bring, but when you stay in Danica's unit you don't need to bring much. We have three children and she had a personalized beach item waiting for each of them which they loved. Out on the patio she had all kinds of pool and beach toys to use. We were ground level which made it so easy to get to the pools or beach, especially with the kids. Our kids LOVED the bunk room. Danica provides a tv for the top bunk and one for the bottom bunk so no fighting. 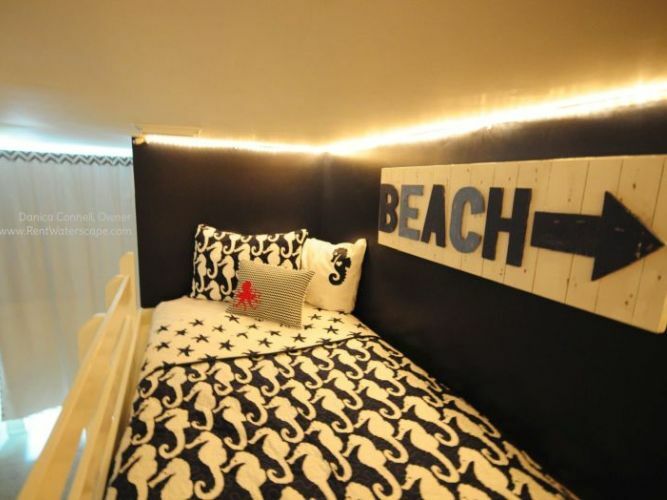 Each room is decorated so cute with that beach touch. Danica provides you with a NICE front loader washer and dryer and all the kitchen appliances you need if you want to stay in and cook of an evening. I would highly recommend this condo unit. If we needed anything during our week stay at Waterscapes all I had to do is text or call Danica and she got right back to me. We've stayed in other units at Waterscape several times, but a stay in one of Danica's units is extra special. My kids loved the kayak, the beach chairs and umbrella, SO many sand toys to choose from, the lovely wagon to carry everything to the beach, the tvs and fairy lights in the bunk room and the close proximity to the pool. Owner Response: Thank you Samantha. Guests who have stayed at Waterscape many times before leave reviews that carry extra weight, as you have units and owners to compare me to. When you say you'll stick with me, it speaks volumes. Thank you for this kind review and I look forward to seeing you in the future! Calling all MOMS! Do you want a vacation where YOU can relax and enjoy time with your family without having to pack everything under the sun? Book this room! We have traveled many, many times with our girls and this is the most perfectly stocked and decorated room we've ever had! The beach toys, sand chairs, umbrellas and cart are perfect! We were able to easily transport everything we needed for a day at the beach in ONE trip! Danica provided recommendations for places to eat, as well as fun things to do. Each one was an amazing fit for our family! During the stay, we needed to make a quick trip to the UTC, and guess what...we found a recommendation for this as well, hanging on our fridge! The location of this condo is PERFECT! You can quikly and easily run from the condo to the beach or pool! How many times have you stepped onto the beach and realized you forgot something? Not a problem in this room! The location has spoiled us to the point, we really don't want to consider another room or hotel! Upon our arrival, our girls were screaming in sheer delight as they found their bunk rooms with individual tvs! The screams returned when they found their personalized T shirts! How amazingly nice! We loved everything about this location! It was designed to be your home away from home! Super comfy furniture, beds and bedding! If you are on the fence about renting this room....just do it! You will be glad you did! They say that love is in the details...Danica thinks of every detail! We were hoping to immediately book for next Fall Break, but the room is already booked! Book quickly, because this place fills up fast! Great clean condo, owner was great to work with! We stayed in this condo Sept 2-8th, the week of labor day, with 4 adults and 4 kids from 2-5 years. Danica told us exactly where to pull up to unload all our stuff which is right outside the door, instead of trying to find a parking space and hall it all thru the garage. This also came in handy when unloading all the groceries. Once we got in the condo she had music playing and sand buckets with each kids' names. Kids loved that! The condo was fully stocked with everything you would need for the week. There was never one thing I said I wish we had. The beds were super comfy and the bunkroom was a huge hit with the kids! The location of the condo was great! It was right around the corner from the waterfall and main pool. When you're on the patio you can see and hear it. This was also a short 5 minute walk to the beach. Danica provided 4 beach chairs and umbrella which was really nice. There's also a bin full of beach toys so you never have to bring your own or buy any. We had the guys set up in the morning and we would come and go all day. It was great! Overall we had a great vacation and will definitely be renting form Danica again. She was very responsive to all my texts and questions, and since we were traveling from Kansas city I had a bunch. She even let us have a late check out the last day since our flight wasn't til 3. Made a huge difference for us with our kids. If you want a clean condo with a great location to everything, this one's for you! We found our family vacation spot! This is our second time here with the same owner and we will definitely be back next year. The owner is fantastic to work with and the condo makes you feel like you're on vacation as soon as you walk in. Its decorated so cute, and it is very clean! I would highly recommend her units to anyone. It's great for children and adults. My kids love the pools and the lazy river. Looking forward to next year!! This condo is hands down the perfect vacation experience. Plenty of space for our family of 8 with everyone super comfortable. The boys loved the bunk room, and having that extra half bath really simplified things. The unit with its terrific layout has living room, dining, kitchen and utility centrally located and bedrooms to the left and right. Speaking of which, TWO master suites, both beautifully decorated and at night the plush beds welcomed rest after a hard day of playing on the sandy shores or in the oasis of pools. Those master baths - HUGE - HUGE - HUGE! Really nice touches throughout the home with the owners personal style, clever designs and super nice furnishings. We appreciated the availability of items like i pod, large screen TV, fully appointed kitchen, HE Washer /dryer, ample linens and beach items. 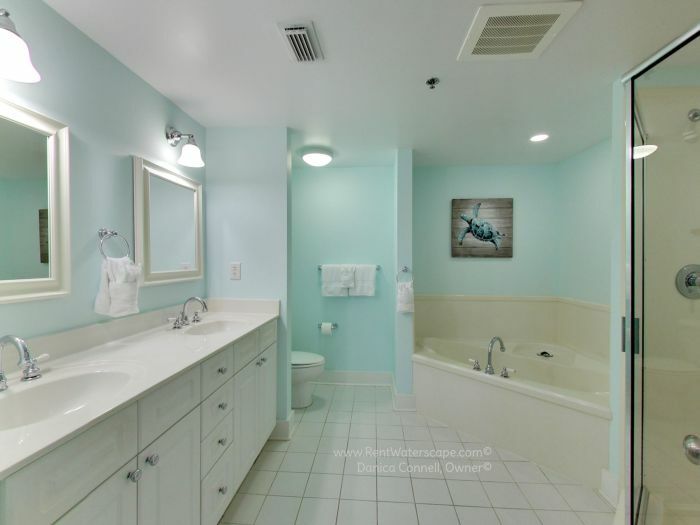 The unit has a color palate that is cool and refreshing putting you in a relaxed state of mind. Cleanliness obviously is very important to the owner and we appreciated that fact. Outside there's a large patio with seating for all, views of the pool area, palm trees, sounds of the waterfall and easy access to all and the beach from the condo. Being a ground floor unit was tremendously helpful for us, the grandparents, with no steps to maneuver and easier with the little one who was eager to jump right in the pool and play in the sand on arrival. Waterscape is a beautiful place with its white sandy beaches at your door, lush grounds and its many pools, play areas, activity nights, lazy river, BBQ grills, snack bar area, and quick access to surrounding places to play and eat. Really a special place to vacation for all ages. The owner, is a great communicator and could not have been more accommodating! Quick to recommend special places to eat, sights to see and promptly got back with answers to any inquires we had. She's exceptional and makes everything so easy and pleasant going that extra mile with attention to her unit and her guests. Renting this condo made all the difference in a meaningful, relaxing and fun filled time with our family. This was our first time staying at Waterscape. We can highly recommend this unit to others. Thank you for sharing your place - we loved it!! This was our second year staying in this unit and it is awesome. It is very clean and decorated with a cute beach theme. My kids love the movies and toys provided. Next year we will pack a lot less since there is an umbrella, beach, cart, & chairs in the unit. The owner goes above and beyond to make sure that her unit is stocked with more than the necessities and sends helpful tips about nearby restaurants, entertainment, etc. We have already rebooked for next year. We love Waterscape and plan to return each year. This unit was everything we were hoping for! We have a large family with 5 children. Everyone was able to very comfortably and there was plenty to do for everyone. 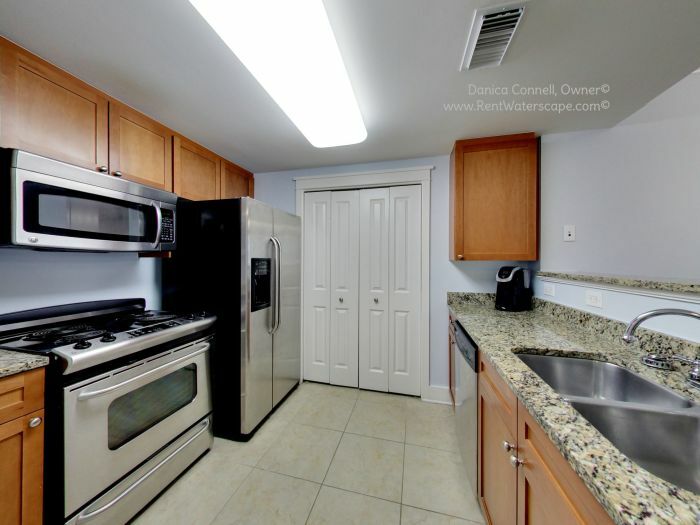 The owner has everything you would need stocked in the kitchen and throughout the unit. We arrived to such a lovely, clean, and beautifully decorated home away from home. The owner is so pleasant to work with. She takes the extra steps to ensure your visit is beyond expectations. This type of attention to details is much appreciated. The fact that this is a ground level unit is so nice as it allowed us to not have to deal with elevators when going to and from the pool or beach. In the Fort Walton Beach area, Waterscape is really the best place for a family trip. There is direct access to the beach and the pool with multiple areas for kids and adults. Danica truly LOVES her condos and this is apparent upon initial contact with her! She wants you to love them just as much as she does so she keeps them clean with up to date décor and fully stocked with such great items. We come to Waterscape each year and we wont rent from anyone else. Such wonderful communication and just not enough good things to say. Thank you for such a memorable beach experience! We rented a condo from Danica. Every detail from start to finish was ON POINT! My husband and I have four kids six and under. We brought my husband's parents to help. The condo was perfect for our group. So clean upon arrival. The owner had gifts for our kids! We decided it would be worth the extra fee to have the housekeeper buy our groceries ahead of time. EXCELLENT COMMUNICATION, EASY TRANSACTION! My kids died when they saw the bunk room, they loved it! And Waterscape was perfect for our young kids. Our unit was super close to the pool and beach. We even had a back yard. You will not be disappointed! The owner even had restaurant and activity tips/advice. The beds were so comfortable too. Highly recommended! Unit was clean and exactly how pictured and described. Owner went above and beyond. Unit is located on ground floor which is nice with kids. Located so close to the pool. Waterscape is clean and my kids loved the pool. The unit was very cute & clean, great location. Close to pools & parking. Kid friendly (I have a very rambunctious 3 YO!) The owner is an absolute pleasure to work with. This was an amazing property and experience. This condo's location was PERFECT. It is the closest unit to the pools and only 6 units from the beach. It's also the closest unit to parking and has pull-up access for loading and unloading. The owner made this trip perfect for us. She was so helpful and her unit was absolutely amazing. It had EVERYTHING we needed and was super clean. The owner is an exceptional communicator. When I return here (hopefully frequently) I plan to re-visit this condo exclusively. The resort itself it AWESOME. Clean pools, nice people, and 24/7 security keeping things in order. Great experience!! This condo far exceeded my expectations. Danica has taken her renter’s needs into consideration and makes your beach experience amazing. The pictures do not do this unit justice. It’s so inviting, calm and surreal. Danica has thought of everything, absolutely everything. She has decorated in such a cute, fun way that it is calming for adults and exciting for the kids. There is nothing you want for, she has every kitchen appliance and gadget you can imagine and everything is top notch. She left some personalized item for our kids, which was such a sweet, extra touch that most owners do not think of. The unit is stocked with books, games, movies, beach toys, floats, sand toys and a very nice beach cart with umbrella and four beach chairs (chairs that recline) for you to use while at the beach. Not to mention the unit was SPOTLESSS, she has employed the best housekeeper in Fort Walton Beach for sure. I also highly suggest taking the housekeeper up on the grocery service. We arrived to a fully stocked refrigerator and pantry. We had absolutely everything we asked for and our vegetables and produce were so fresh, this was such a nice perk. The location of this unit is Stellar to none. It’s so convenient to everything; yet it’s also private given that it’s in the corner. It’s located by the waterfall at the main pool and is so calming to listen to the waterfall while out on the patio. I could go on and on about how nice this unit was. We will certainly be repeat customers…..
My family had a wonderful beach vacation and could not thank Danica enough! She has taken extreme care in making your stay an awesome experience. 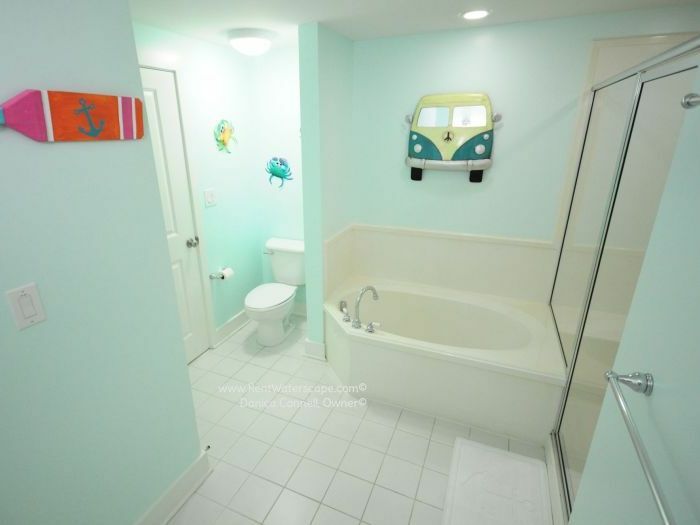 The condo has everything you need for vacationing with kids - from beach toys, floaties, and a wagon, to step stools, kids movies and a bed rail! My young girls were in LOVE with the bunk room and it gave them a nice place to chill and relax in between pool time and beach time! The ground floor access was a great plus too. The resort had all the amenities - we used the fitness center, the snack shop and tried every area of the pool. The beach was beautiful and Danica provided everything you needed. It was great having laundry in the unit. There were great restaurants within walking distance and the overall experience was amazing. Both Danica and her housekeeper were so responsive and wonderful to work with and I have been raving about our trip to everyone since the moment we left. Highly recommend! When you first walk into the condo, you hear beach music playing and the excitement starts! The colors in the condo are welcoming and calming! It is SPOTLESS!! I have never felt more comfortable staying away from home as I have here. There are some goodies for my three girls and we are all ready to explore. We packed light because Danica has EVERYTHING you need! Beach toys, floats. chairs, umbrellas and a cart to haul it with! The pool and amenities are great for anyone but especially children. Danica takes care to make sure you are well taken care of! I would definitely go back and ask for the same condo! We really enjoyed our time there! It was a great Mom and girlies trip! We had a wonderful time during spring break 2017 in this very clean, very equipped, spacious condo. I would definitely recommend this condo to anyone wanting to have a very pleasant experience. It was located in the prime location for our needs. This property is one in a million. We went on a girls weekend and this was the perfect spot for us. There was plenty of room in the unit for four adults! We loved the two full bathrooms. It has the perfect spot to unload before parking and it had everything you would need for a beach trip. The kitchen was well stocked, it even had a Keurig. The unit was very clean and I loved that it had a number pad to get into the unit. I loved not having to keep up with a key. Danica was wonderful! She even sent a list of great places to eat. We tried two of them and loved them both. You won't be unhappy with this unit!! I can't recommend this property enough! The owner, Danica, is such a pleasure to work with. She is so in tune with what we needed for a vacation. Everything we could possibly need was in this unit (except we bought some food). The location is so wonderful... private patio, quick access to the pool & beach with NO ELEVATORS!!! The unit itself is so clean & lovely and had plenty of room for 3 adults and 2 children. If we go back to the area, we are definitely booking this unit again. The entire resort is wonderful. The pools are exceptional and the beach is so clean and the water so clear. We cooked our own food the entire time we were there since the kitchen is fully equipped and we used one of the resort grills on the pool deck once also. My kids LOVED the bunk room with their own private televisions in their bunk. I don't have one complaint (and... I always leave completely honest reviews!) Thanks for a wonderful vacation Danica! If you do not stay here you are missing out! So I booked this room as a surprise for my wife's 40th birthday. I had her two best friends flying in to surprise her and spend the weekend at the beach. Not only did the room far exceed our expectations the level of service from the owner was AMAZING! She recommended places to go, eat and relax and really helped me facilitate the whole thing from my computer. My wife and her friends are still talking about it and said it was the best trip they have ever been on together. They couldn't believe that I had put that all together for them. Well sshhhhhhhh don't tell them but it was the owner and her staff who really helped me put together all of the details. I know you are narrowing down your choices of rooms to book. I am telling you that if you do not choose this room you will be missing out. We've travelled extensively in the US & Canada, stayed at many places. This condo ranks among the top places we've stayed. Everything about it is wonderful - location, cleanliness, attention to detail, kid-friendly, beautiful colors & amenities. Our first trip with our grandchildren to Waterscape & it was absolutely fabulous. Everyone enjoyed it and we made some amazing memories! This ground floor condo provides easy access to the pools, lazy river and the beach. Danica provides many extras - the beach cart & beach umbrella were sooo nice and our grands loved the extra beach toys. Danica's great to work with, very responsive. Her property descriptions are accurate & complete. No negatives, many positives!! This was our first visit to Waterscape and we absolutely loved it. The condo felt just like home and had all the amenities you could want. The owners attention to detail was impeccable. I have stayed in many condos along this area over the years and this was by far the most comfortable and cleanest unit I have encountered. You will not regret renting from Danica! We plan on booking this same unit again next year! Waterscape is a spectacular resort without a doubt. For the absolutely best Waterscape vacation rental experience, you’ve got to book this unit or one of Danica’s others. You will simply be amazed! Read through her property descriptions and a few reviews and you will see just how awesome Danica is and how extraordinary her condos are. I was so completely satisfied I’ve already booked this unit for next summer!!! From the instant we made contact with Danica, our experience was off the charts amazing! My brother said right away..."you're going to love this lady! She makes me feel like we've been friends forever!" To us, this is priceless. Like a lot of people, we've had health issues in our family and unpleasant experiences to deal with in life. Spending precious time with family ranks at the top for us! We cherish the time we have together. Living 16 hours apart can make it challenging. Finding this condo was perfect for us. We all LOVE the beautiful Emerald Coast! The beaches here are like none other. Waterscape is an incredible place with so many fun features...we never tire of the lazy river! Danica not only provides a beautiful place to stay with everything you can think of, including pool/beach toys...with an air pump! But, she had personalized gifts for the kids! Perfect! I'm mean, when we walked in and saw those, we felt so welcomed! It was an attention to detail that meant a lot to us all! She even left a fun treat for the adults. She is super easy to work with. I can't say enough good things about her. If we lived close, I would want to spend time with her! She is Amazeballs! Off the charts amazing! I look forward to our next visit in this condo. Oh, AND it's in the perfect spot. Super easy access to everything! From loading/unloading to walking out to the fabulous pools! Also, there are many restaurants and shops within walking distance. Such an easy place to relax, enjoy the beach and spend time with loved ones ❤️ We feel so blessed! We absolutely loved the condo! We have stayed at Waterscapes multiple times and this is by far the best condo we have stayed. The décor is adorable and the king tempurpedic beds are awesome. We also really appreciated the proximity to the pool as well as all the pool toys Danica included. We were a bit concerned that we would get a lot of noise from the pool during the day when our son was napping, but the windows are great quality and we couldn't hear any outside noise while inside. Danica was also really great to work with. She was incredibly responsive and helpful. 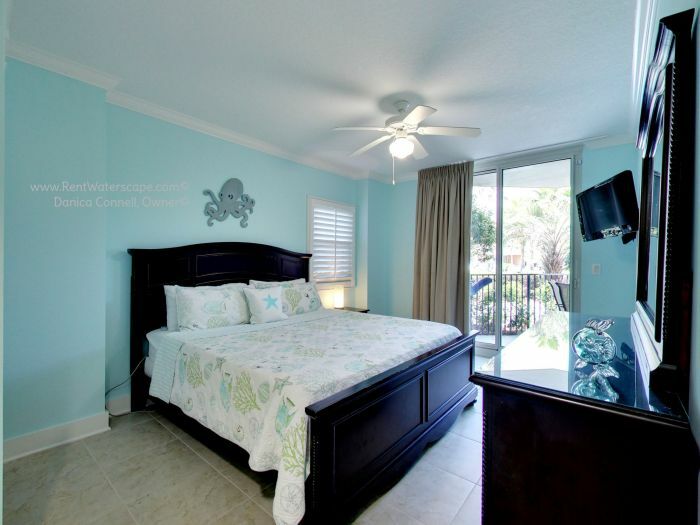 We would highly recommend this condo and Waterscapes! The owner of this unit was extremely helpful and kind which is HUGE for me in helping to make our vacation experience pleasurable! This unit was perfect for us because of the king beds in both bedrooms. We love the Fort Walton area and especially the Waterscape because of its child friendliness! We are already looking forward to vacationing with Danica next summer and bringing our new grandbaby! We had a great time at the resort and the condo was awesome...working with Danica was a pleasure, she took care of everything we needed. Location of the unit is perfect..close to everything!! Our kids loved the bunk bed area and the pools. This property was great for families! Lots of room to sprawl out and we all enjoyed the great access to both the beach and pool. We met a couple who had a great ocean view but it was so inconvenient to try and get to the pool they weren't happy. This unit was a breeze to get to anything and quite private on the patio. Nicely decorated and well equipped for everything we needed during our stay. The owner was great to work with. Very responsive, helpful, and friendly with every interaction. We would book with them again! Owner Response: Christy, I know you had some technical issues and went through a lot of effort to write this review, so I'm taking a few extra steps to tell you that I appreciate you being devoted to the cause! :-) You were super to work with and I hope you had a terrific "first" VRBO experience. I hope to have you again!! This was our first time to get a condo and we will certainly be doing it again!! We had the most wonderful week and the condo is in a fabulous location!! I will stay here again and again and again!! We were on the ground floor, right by the pool and steps away from the grill. The condo was super clean and every room was so cozy! My 9 & 12 yr old had bunk beds at home so when I told them they were staying in the bunk room the 12 yr old was NOT happy. She said she'd sleep on the floor....UNTIL SHE SAW THE BUNK ROOM!!! It is amazing, they loved it!!! Can't say enough what a great condo and trip we had!! I had to cancel my stay at this unit only a couple of weeks before my stay. Danica was very understanding and immediately put my mind at ease that she would do her best to find another renter. She checked in with me every couple of days until she was able to get a new renter and I was able to get all of my money back. I can't say enough about her level of attentiveness to her renters. I have rented another one of her rooms at Waterscape and she was very prompt. Very friendly. Easy to work with. Very organized and truly cares for her renters. She treats these rooms like they are her home. 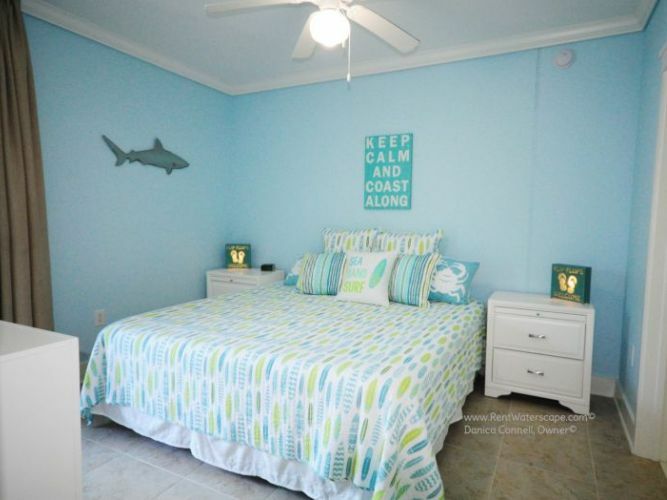 You can't go wrong with renting this room from Danica. I've never worked with a better renter. The condo was one of the cleanest places I have ever stayed. It was really nice to stay in a place with a comfortable couch....not wicker! The decorations were superb and the locations is great. Literally steps to the pool... On the ground floor. The resort has lots of kid activities and the pools were well kept. Loved the Fudpuckers poolside grill. I will def come back! Such a wonderful family friendly resort! The moment you walked into the condo you felt like you were on vacation! Beach music played the moment you opened the Door. The bunk room was decorated so nice with rope lights throughout. Kids loved that special touch, and the small surprises left for them! 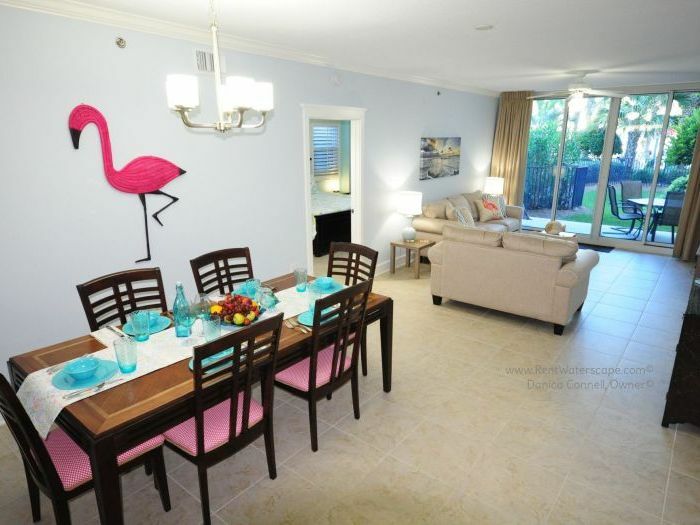 The condo was beautifully decorated with fresh light beach colors throughout. It made the rooms feel bright. 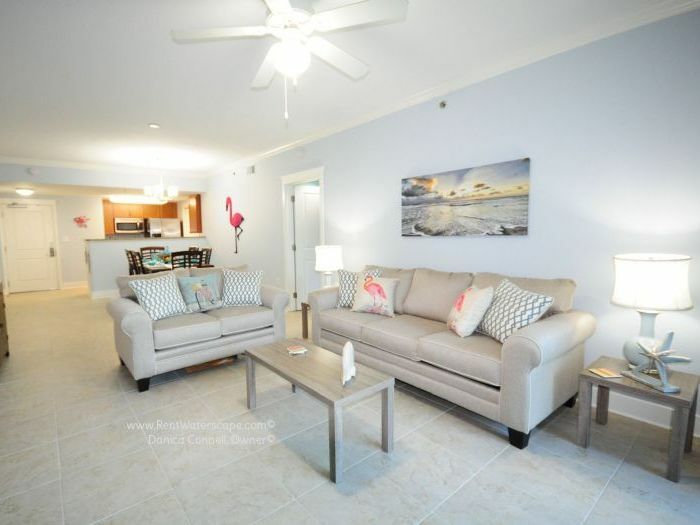 This condo was located in a perfect central location, close to the main pool, next to the elevator for the splash pad on the second level, and a short walk to the beach. The private patio was wonderful for relaxing, with a table and chairs, and 2 lounge chairs. Kids loved the deck box full of pool/beach toys. Anything we needed was supplied with a fully functioning kitchen, non-stick pans, a keurig brewer, waffle maker, and washer/dryer. Of course many other kitchen gadgets to make any meal you like! We especially loved the wagon to take to the beach and the huge beach umbrella( that I almost bought before our trip) The owners were so easy to work with, and gave great local tips! I will definitely be back, one of the best vacations yet! And the beach was beautiful, crystal clear water and white sand! Can't beat that!